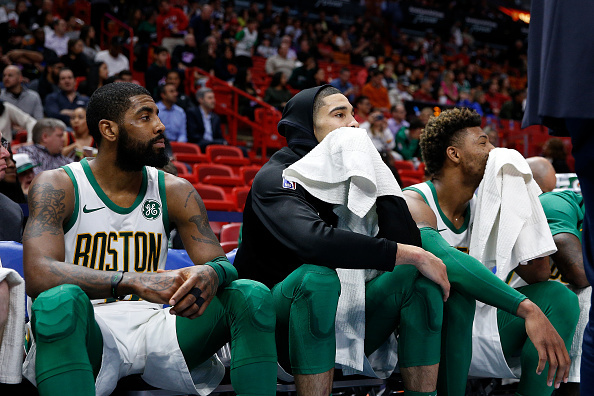 The Boston Celtics suffered their worst loss of the season on Tuesday night, as they fell to the Toronto Raptors by the final of 118-95. After the loss, head coach Brad Stevens told reporters, "I thought we were just outplayed in every which way." Shooting guard Marcus Smart explained, "we're just not together." "What are the main ingredients to those collapses? Not being together," Smart said, per ESPN. "And that's it. We're just not together. Plain and simple. That's it. Because if we were together, that wouldn't happen. We're all talking and linking up, but like I said, it's something we're going through, and it's something we're going to have to continue to work at and figure it out." "This is real," Stevens said. "The reality is that we're taking a lot of shortcuts and not being as solid as we have been in the past in the last two games. I thought we were really good against Milwaukee. So, it's not like we don't know what we need to do, but for whatever reason, we've taken too many shortcuts. You can't do that against any team. Certainly tonight, they exposed us and played great." When asked how the team could address those "shortcuts," All Star point guard Kyrie Irving responded, "I don't know. It's up to Brad." Asked whether he agreed with Smart's remarks about the Celtics' not being together, "That's Marcus' opinion," Irving said. "I respect it." The Celtics (37-24) are currently sitting in fifth place in the Eastern Conference.